For installing car spoilers, bumpers or body kits to your vehicle, you will need strong adhesive to ensure that it is securely stuck to the car. Both the cars interior and exterior require certain types of glue for car parts. The best glue for plastic car parts is Tiger Seal U-Pol Adhesive, which will permanently stick car parts the intended surface. For part that may need to be removed, the 3M 03614 Double Sided Tape is ideal and can be removed safely. Due to the amount of automotive plastic, fabric or fiberglass parts, there is a range of suitable car glues available for specific tasks. Before gluing anything, you should consider whether you need the glue to be permanent or removable too. When it comes to glue for sticking car trim, you will want it to be strong, easy to use and not messy. Plastic car parts such as clips, buttons and other components are easily broken and using an automotive glue for cars is the best method of fixing it. There are many car adhesives that can be used on both interiors and exteriors but not all are waterproof. On top of this, another factor to look out for is how easy it would be to remove the adhesive in case you need to remove the car part. Sticking car parts with glue needs to be secure with no movement when it is fully bonded. Below is a list of the best glues for plastic car parts that are suitable for a range of automotive components and are easy to apply. Tiger Seal U-Pol is by far the most popular automotive adhesive in the UK and is gradually becoming more popular in the US. It is the strongest car glue available that will permanently seal plastic trims, bumper, body kits and much more. It is important to note that once the cartridge has been opened, the exit tube become solid and difficult to clear. We highly recommended pushing a long nail down the tube, which can make it reusable at a later date. Overall, it is the best glue for plastic car parts that you want to be permanently stuck to the car. Once settled, you will find it very difficult to remove, which makes it ideal for automotive use such as gluing spoilers, bumpers and more. 3M are a worldwide popular brand for detailing and bodywork automotive products. Their double sided adhesive tape is an alternative to the glue form with the added benefit of being easily removed without causing damage. 3M claim that their tape uses the same technology used upon airplanes and skyscrapers. Therefore attaching plastic trim and body kits should be a walk in the park. To apply the tape, all that is needed is for you to cut it to the specified length, remove the liner to expose the adhesive and finally hold in place firmly. Overall, if you require a glue that can be removed at a later date, we highly recommend the 3M Double Sided Tape. It is ideal for sticking car trim, spoilers, license plates and so much more to your car. For larger car parts such as bumpers or anything that needs permanent bonding, we recommend choosing the Tiger Seal. Another 3M automotive adhesive is the 38808, which is ideal for interior fabric and headliner repairs. It is an aerosol spray, which makes application much easier and allows you to evenly cover any surface. Overall, there is no match in terms of performance, it is the best glue for car headliners and other interior fabrics that require sticking. The 3M 8808 spray does an excellent job unlike many of the cheaper alternatives. Goop isn’t a large brand by any means but their adhesive glue is specifically designed for automotive parts. For repairing tears in car seats to convertible tops, this product is strong and flexible, which provides excellent results. One drawback is that the container is fairly small but this does make it easier to reach small gaps than many of the alternatives. Overall, it is the best cheap car glue for automotive plastics and various other components. Many people may require a fast action glue that bonds a car plastic trim to the metals in a matter of minutes. The J-B Weld 50139 will do this in approximately 15 minutes with their high strength automotive adhesive. Overall, it is the best glue for fast bonding and works great for small parts such as buttons, clips and other plastic trims. For larger automotive parts, we strongly recommend using alternatives because it will use far too much of the J-B Weld. From broken clips to buttons, having glue for car plastic trims readily available to you can save the day. Domestic glues are not up to the job of withstanding the punishment and environmental factors that a car will go through on the road. Specialized adhesives provide a stronger bond that is designed for automotive use. To help you make an informed buying decision, we have put together the below buying guide regarding automotive adhesives. Glue for plastic car trims can come in a range of types that are designed for specific jobs. For example, glue for car headliners are normally in the form of an aerosol whereas spoilers require a thicker and stronger adhesive from a tube. Ensure that the car glue you choose is up to the job of efficiently sticking plastic trim to your car. The wrong glue can become a nightmare to apply correctly or remove when you need to take the part off. After you have applied any of the glue, its important that you allow it to settle before taking your car out on the road. 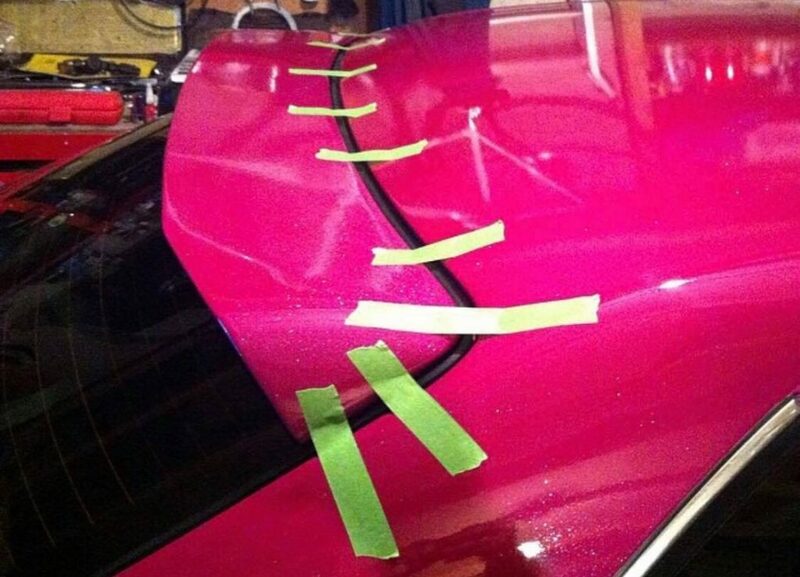 We strongly recommend using tape to hold the car part in place (as shown below) to ensure that it sticks correctly. When it comes to repairing items such as car bumpers or trims, you will more than likely require a permanent car glue such as the Tiger Seal. However, if you were installing a spoiler that at a later date you may want to remove, its not advised to use a permanent glue. Trying to remove a glue such as the Tiger Seal will not only require a serious amount of effort but may also cause damage to the vehicle. There are many semi-permanent automotive glues available and our favorite is the 3M double sided tape. Once applied, it forms a strong bond that will be able to withstand the outdoor elements and many years. However, it can also be removed when you wish without leaving too much glue residue. Before purchasing any glue you should decide on whether it is to be permanently stuck to the car or not. The result of removing car parts such as spoilers, plastic trims and body kits is the tough residue left behind. Avoid picking the residue with your finger nails or over washing the area because this will cause damage to your paintwork. We highly recommend investing into a rubbing compound that will easily remove any residue. Most will require use of a car buffer but this will be the safest method of removing the residue. If it is failing be removed, you may require light sanding and then polishing again. Gluing plastic car parts back in place is far easier than you would expect. There are now hundreds of automotive adhesives that will be able to withstand testing weather conditions and other outdoor elements. All of our recommendations are the best for specific tasks and are easy to apply without being too messy. I have a lease car. Want to glue small item to the roof- to stay put and last thru car wash- but need to be able to remove it in a few years w/o damage to car. Advice? Thank you. Leasing a car is always risky when doing modifications but if it is something that you really want to do, then I would go for it. With regards to glue on the roof, you can simply use a car polisher machine to remove any excess residue that is left behind. If you cannot do this yourself, any professional detailer will be able to do this for you. However, do take care when applying the glue. Personally I wouldn’t do it to a lease car but that is just me! I need to glue my inside drivers door handle in my vw beetle. What’s would be the best glue to Use? The rubber seal beneath the drivers door on my Ford C Max has come away. Any suggestions as to the best adhesive to use. Thank you. Hi Ron – The Tiger Seal would be ideal for a job like this. Ensure that you use thin portions because it could get messy otherwise! I need to glue a plastic (PP) / aluminum gas pedal cover on a Subaru Forester. What would be the best product to use? The 3M doubles sided, considering that at some point it would be necessary to change the pedal cover again? Or the Tiger one, if I assume that such a pedal cover will last for at least a decade. Thanks so much for your guidance. Hey Erwin – Realistically, do you think you will be changing the pedal again? I would go for the 3M double sided tape if you do intend on removing the pedal again. Trying to remove something that has been stuck on with the Tiger alternative takes a serious amount of effort (Trust me, I have been there!). Hope this helps! The side skirts on my Fiat 500 Abarth were removed by a body shop and I need to reinstall them. The residue left behind is difficult to remove. They fit as is. What would be the best adhesive to permanently bond them to the body of the car? Hi Ken – Funnily enough, I was in a similar situation. Whilst having a rear arch painted on an AMG Mercedes, they accidentally tore the side skirts clips. However, a few blobs of the Tiger Seal did the job of holding it to the car. 2 years on and it is still rock solid! The main picture of this article (my classic Mercedes) was also bonded permanently with this stuff too. The door card on my Astra H has started to come apart, I need to take it off and put it back together. Tried a hot glue gun already and it’s comes apart. I need to remove the glue and try something else, I would like to try the tape as I imagine is not as messy and quicker to bond. What would you recommend? Thank you. Hi Samy – Do you mean the door card is falling away from the door itself or just falling apart from itself? If it is falling from the door, I would try and fix the clips beforehand because if its glued on, it would be very difficult to remove. For example, you may need to replace the window regulator, which requires taking off the door card. If the door card is falling away from itself, the double sided tape would be a great option. The Tiger Seal is the strongest but you may need to use a lot of it for a full door card, which may give off a chemical scent. I have a Jeep Grand Cherokee that I bought wireless logos. The adhesive attached does not really stick to the car door. What is the best adhesive to use? I also may want to remove it in the future. The plastic wheel well molding has come loose at the end of its run on my Grand Cherokee Summit. It was originally attached with tape. It sticks out from the fender about 1/8 inch like it has a memory, I can push it in with a couple of pounds of pressure. Grass has just enough room to get stuck in it (offroad). Hope this makes sense. Look forward to your recommendation! Hey Lewis – For this, I would definitely go with the Tiger Seal! Its sticks like nothing else and I have used it on my 4×4 for the exact same thing but a different car. Hope this helps. Hi, my bumper slightly came off on the right side. Basically a piece chipped off. I can easily just push it back in but it keeps coming back out. A very small repair. I have a Nissan Sentra 2010, What glue would you recommend for me to get to just have the bumper stick? Its a preowned used car! I have no intentions of fixing my whole bumper or spending so much money for a small fix! Please let me know!! Hey S.B – Definitely the Tiger Seal for this! Hi There! What glue is the best option for me? The casing around my mirror was knocked off taking the securing tabs with it. I glued it on once and it came off going down the highway. Honda tells me I need to replace the entire mechanism ($1k+). I would prefer to just glue another outside casing to the mirror as the mirror still works fine. So what glue would be best in this case? Many thanks for any insight you can provide. Hi Dan, I have a leased car that I want to attach a spoiler to. It does not require any holes or screws, just an abs spoiler. I want to be able to remove the spoiler in three years when I return the car. Any advice on a removable adhesive that wont damage the car paint when removing it? Also, will 3M double sided tape be able to hold the spoiler. It is not very heavy spoiler, just aesthetic mainly. Also, if you have any advice on where I could look for OEM BMW parts used or new at discounted prices, I would be much obliged! Hey Crystal – I would avoid the double sided tape and go for Tiger Seal, J-B Weld or the Amazing Goop. After application, I would give it a few hours to harden too. Hope this helps! Hey – With regards to the spoiler, I would recommend using the 3M double sided tape as this is less likely to cause damage or leave tough residue once removed. If there are any markings that are left, they can be easily removed a good quality rubbing compound. I would avoid the Tiger Seal as this may damage the paint and is only advised if you intend on never removing the spoiler. With regards to BMW parts, I always seem to find my bargains via enthusiasts forums. Hi Dan, My side skirt near my front passenger wheel is slighting separated from the body. I suspect this was the service technician at the dealership improperly hoisting my car. Anyhow, I don’t want to remove the entire side skirt. Not sure if there is enough room to slide in double sided tape to re-attach. I hear frequently that the area needs to be cleaned before glue or 3M tape but I notice the old adhesive is still there. I’ve tried to re-attach it with the old tape on but no luck. Can I get away with just using tiger seal without cleaning both sides of the side skirt and panel? I’m afraid of rust build up. Hey Gary – That is annoying if it was the technician! I have attached multiple side skirts using the Tiger Seal. However, as you have mentioned, I would clean the original adhesive prior to using the Tiger Seal. If you are worried about rust, I would suggest that you use a rust prevention spray after cleaning, then allowing that to dry before using the Tiger Seal. Hi Dan – I bought an aftermarket plastic grille for my pickup truck, and I need to glue a rubber weather strip onto the plastic grille which has a slight contour on each end. (2010 Toyota Tacoma). Need something permanent and waterproof. Your suggestions please? The Tiger Seal really is the best option but if you are intending on removing it at a later stage, you may struggle! Hi Dan, I am the proud owner of a Honda Civic Type R. I was hit by a Tennis ball thrown from the rear twin wheels of a truck on a motorway. By the time I was able to stop the wheel arch trim, part of the ‘body kit’ was ripped off from the front to the last 6 inches. I have tried a bodge up repair several times but nothing seems to work. Then I found your article, and all of a sudden I’m spoilt for choice. Tiger Seal or GOOP seem to be favorite at the moment but I would appreciate your recommendation.